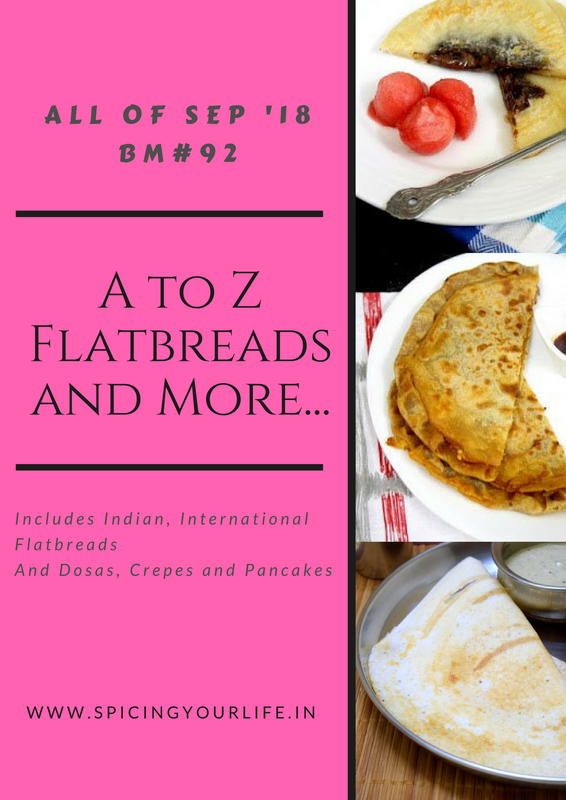 So we have reached the final letter of the A-Z International flatbread series and I am concluding my first ever Blogging Marathon with this yummy Zhingyalov hats. Zhingyalov hats also known as Zhengyalav / Zhangyalov hats is an Armenian flatbread stuffed with finely diced herbs and green vegetables. It is a traditional dish of Armenians from Artsakh and Syunik. Dough is rolled out as thin as possible and is then filled with a stuffing that consist of 10 to 20 types of diced Vegetables and oiled herbs. One of the most important steps in preparing good Zhingyalov hats is the green composition. Leafy vegetables like lettuce, spinach, beet greens and herbs with less taste make up the base of the stuffing . Herbs with peculiar taste , sour or spicy ones are needed in small quantities and then the bitter-tasting greens . After the stuffing, the Zhingyalov hats are fried for around 10 minutes on a special griddle called ‘saj’ / ‘sajin’ or in a tandoor for a couple of minutes. The ready dish is consumed with beer or wine and is especially popular during the Great Lent. The recipe I referred, added some olive oil, salt and black pepper to the green stuffing and was cooked on a pan. The dish though looks similar to Indian “thepla’s” but is way different. First the greens are stuffed without cooking and hence they do have a bit of raw taste to it. So to be honest, not everyone might like this dish specially people who do not enjoy vegetables :-). For my preparation I added a mix of 5 vegetables ( Spring onions, Spinach, Kale, Methi (Fenugreek leaves) ,mint) . I simply washed and chopped them finely, added some herbs followed by oil, black pepper and salt onto it. The dough for this dish is similar to lavash dough and I added a mix of whole wheat flour and all purpose flour (maida) instead of just using all purpose flour. To make nice and soft Zhingyalov hats let the dough rest for atleast 1 to 1.5 hours. Please do ignore my not so good pics as was really taken in a lot of hurry. So here goes the recipe. Zhingyalov hats is an Armenian flatbread stuffed with finely diced herbs and green vegetables. It is a traditional dish of Armenians from Artsakh and Syunik. In a large bowl add in the flour, sugar, dry yeast and salt. Mix everything. Add in the water slowly and make a smooth dough. Let the dough rest for 1 to 1.5 hours. In the meantime wash and chop all the vegetables finely. Add in 1 tsp olive oil and black pepper to taste. Mix everything. Just before making the flatbreads add salt to the greens, or else it will release water. After 1 hour or so, knead the dough again for 2-3 minutes. Roll each into cylindrical disc of 6-7 inches as thin as possible. Use dry flour if required. Add in the herbs mixture on one half of the rolled flatbread. Spread it evenly leaving 1 cm edges from the sides. Carefully put the other end on top of this and seal the edges. Give a nice pat to the flatbread so that everything gets distributed evenly. Heat a non stick or a cast iron griddle to medium or slow and cook the flatbread on both the sides until golden specs appear on both the side. Repeat the above steps for remaining dough balls. Serve it as is or with a sauce of your choice. Kudos to you Renu, Zhingyalov hats is definitely a beautiful choice for Z. I want to make these flatbreads too, but somehow i went for an another flatbread. Too good and with all those greens went in it, am sure these flatbreads will definitely become my favourite too. Such a unique one for the finale Renu! Love these pocket bread…reminds me of pita. You have presented such a beautiful and fabulous array of flatbreads this whole month. Kudos! That is an awesome bread to end this fantastic series, Renu. Congratulations on successfully showcasing 26 flatbreads from all over the world. I have bookmarked quite a few and look forward to many more interesting breads from you. Love your collection… Its really very unique and interesting recipe with Z…. Look alike pita breads. Great pick for Z ! And the bread with that green healthy stuffing looks wonderful ! A international Ato Z Marathon is rather tough but I must say very well executed . The pics look absolutely fine Renu ! That is a wonderful find Renu. The bread with so much of greens is highly nutritious and I would love it with a cup of coffee.. Fantastic pick for Z and a wonderful series. I loved this flatbread and wasn’t so adventurous as you in trying so many different greens. So healthy as well! Renu congratulations on completing your first Mega BM, aren’t they fun? The flatbread is so interesting, love the name. What an interesting filling using all the greens possible. Such a nice bread to end the series with! Lovely green stuffing and I am sure it tasted awesome too! loved this armenian flatbread, loaded with so many greens. I am sure about the flavor it would be giving. Great pick Renu. That is such a unique recipe and I am so glad you found this and brought it to light. Looks wonderful with that stuffing.